Here are the initial photos of 1631Q. This interior was a mixture of original Cessna and a series of partial reworks. We'll take it down to the bare bones and make an updated version that features leather seats and a metal instrument panel. First off, the seats come out for inspection and renovation. The upholstery has been previously repaired with what looks like automotive material and furniture jute webbing. This soon gave way resulting in the pilot sitting almost on the floor. The frames are cleaned down, primed, and refinished with Jet-Flex interior finishing process. The cushion supports are replaced with ceconite and all new cushioning is fabricated and installed. New seat backs are fabricated from sheet metal and a pleated, leather map pocket installed. 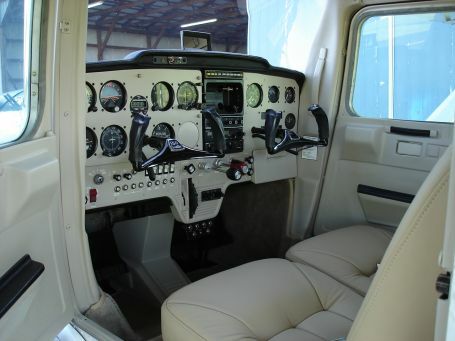 The whole process is finished with European leather in a Santiago color using top stitching and custom embroidery of the Cessna logo on the seat back. All the interior plastics are removed and the interior cleaned and the paint removed from the door jambs. The jambs are then masked, treated, primed, and refinished with Jet-Flex. Additional sound dampening material is added to the cabin at this time. New interior plastics are prepped for installation. This requires lots of cutting, trimming, and fitting of each part. The installation of the wide tiara requires some additional riveting, but well worth the time. All the parts must be fully installed to insure proper fit before final finishing. After fitting, the parts are then removed, cleaned, and finished with Jet-Flex. Finial installation is much easier after everything is fitted and finished. The carpet was previously replaced with a one piece kit interior carpet. This was a thin fuzz carpet (Notice where it buckeled up near the center console ?) and it also had the black foam on the back of it which deteriorated and left a sticky, black dust all over everything. New floor carpeting is then fabricated in the original Cessna pattern (notice how the floor pans now have the smooth detents ?) and installed the complete set using our Moonstone color. Also added a custom pull-out floor mat to the front section. Both upper and lower panels are removed. Fabricated a new lower switch panel and installed new circuit breakers. Fabricated new upper panels and finished to match. Cleaned and powder coated both control yokes with Mirror Black. Also added push to talk switches on both yokes. The eyebrow is also reupholstered with leather.